This month, she was named one of Time magazine’s persons of the year. She was one of a group, which Time called the “guardians,” that also included murdered Saudi commentator Jamal Khashoggi; the staff of the Capital Gazette in the US, five of whom died in a mass shooting at the newspaper’s offices in June; and Reuters journalists Wa Lone and Kyaw Soe Oo, who have been detained in Myanmar for nearly a year for their reporting on the persecution of the Rohingya. 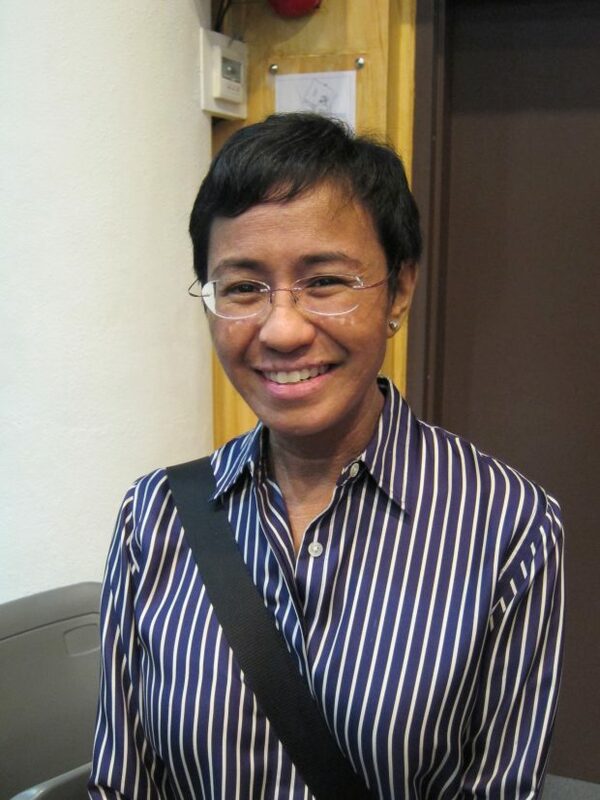 In November, the Committee to Protect Journalists (CPJ) gave Ressa the Gwen Ifill International Press Freedom Award, among a brace of other honors she has received. In the US to receive the award when news came that she was facing the tax charges, she came home to fight in person and posted bail to avoid arrest. She accused Duterte’s supporters of spreading coordinated lies through Facebook. She and her technology team at Rappler have tracked how attacks and fake news are used to undermine truth and journalism. “Rappler couldn’t have become Rappler without Facebook,” she told the senators, but she cautioned that the platform is dangerous on geopolitical, financial, political and other levels, as she flashed screen shots and charts to illustrate her point on how a network of trolls is used to spread disinformation in the Philippines on Facebook. In October 2018, Rappler began running an extraordinary series called “ ‘Some People Need Killing’ — Murder in Manila,” by journalist Patricia Evangelista. The six-month investigation details how the police used and sometimes paid vigilantes, gang members and others to ratchet up the body count in the grimmest district of Tondo, the worst slum in Manila and one of the worst in the world. The violence of the war on drugs, the use of murder as a tool of public policy and the open disregard for law and the courts is nothing new in the Philippines. Presidents, warlords, politicians and various kinds of insurgents have been murdering with impunity in the country for generations. Duterte just took it a step farther, turning the use of death directed against the underclass into a political selling point. Duterte learned the tactic when he cut his political teeth as a prosecuting attorney in sprawling Davao City on the island of Mindanao at the end of the era of the late dictator Ferdinand Marcos, who also used wars against drugs to justify violence, albeit on a more modest scale than Duterte. Duterte’s simplistic message — like that of other current autocratic populists — was fraught with danger, but that hardly mattered. His team of trolls and Facebook experts, helped by Cambridge Analytica, the political consulting firm linked to Brexit, the Trump campaign and others, and which is embroiled in the global scandal over the use of Facebook users’ data, cast him as a hard man of action, and he easily won the 2016 election for a single six-year term. It is ironic that he succeeded President Benigno Aquino Jr., whose mother Corazon led the battle against Ferdinand Marcos in the 1980s and was widely seen as the moral force of the nation after she became president in 1986. Ressa is one of a long line of female journalists in the Philippines who in the last 30 years or more reshaped the media landscape. Where once the Philippine press was largely the province of clubby, hard drinking male reporters who could easily be swayed by tough politicians, cops, soldiers and tycoons, the end of the Marcos era saw the emergence of feisty magazines and tabloids run by crusading female editors and publishers who challenged Marcos and helped pave the way for the emergence of Corazon Aquino. Rappler and Ressa are firmly in that line.